I don't know this part of Norfolk at all well. 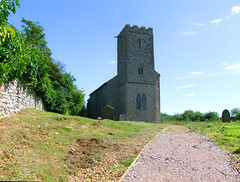 I climbed the road up from Great Bircham without really knowing what to expect. 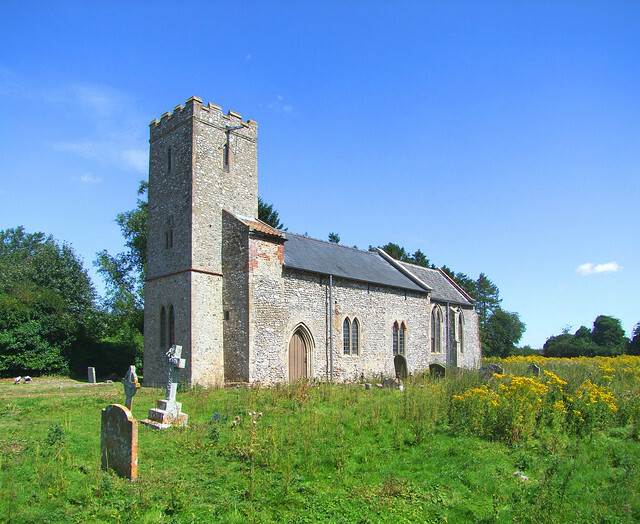 St Mary at Great Bircham was a big church, but as I came into Bircham Newton after little more than a fleeting glimpse of fields, I saw that All Saints was something quite different, a small church with much to show of its Norman origins. A hilltop church, but the most striking thing was that the long graveyard beyond the church was almost completely submerged in a sea of waist-high yellow flowers. I get so used to seeing churchyards trimmed within an inch of their lives by August that I did wonder for a second if All Saints was still in use, but I need not have worried. I stepped into an interior which is nothing short of an utter delight. 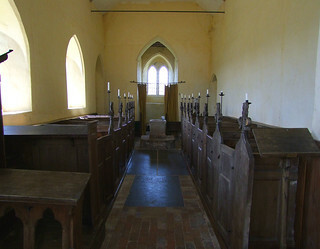 The rugged font, melting like a big fat cheese, sits on the stone flagged floor, and to the east spreads a delicious range of mid-19th Century box pews. 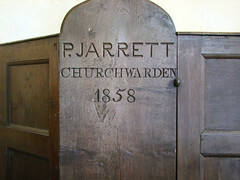 This is the result of a gentle restoration of 1858 under the auspices of one P Jarrett, churchwarden, who had his name proudly inscribed on the north side westernmost pew. Mr Jarrett was probably the kind of churchwarden who didn't know much but knew what he liked, and thank goodness he stuck to his guns here. 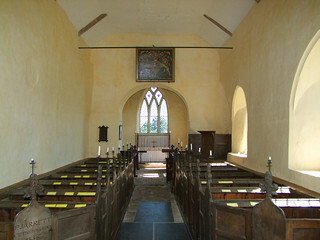 He was probably getting on in years, because the restoration harks back to the English Church of half a century earlier, and the two decker pulpit and the Hanoverian arms above the chancel arch are a truer mark of the church's character. 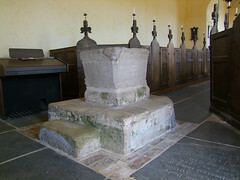 Like the font, the chancel arch looks as if it might be melting. 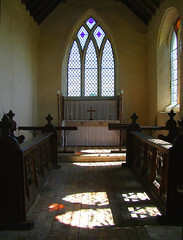 There is no coloured glass, and light filled the church on this summer afternoon, slanting in from the south and warming the woodwork, casting images of windows across the stone floor. 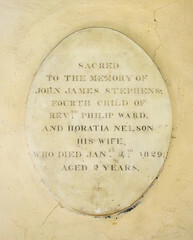 Stepping up into the chancel, which is tiny and all of a piece, there is a simple memorial on the south wall to a two year old boy, John James Stephens Ward, son of the Rector. The thing that makes it noteworthy is that he was Nelson's grandson. 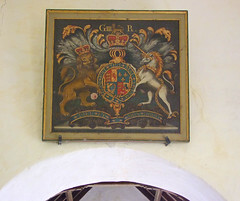 His mother, Horatia Nelson, mentioned on the memorial, was the illegitimate daughter of Nelson and Lady Emma Hamilton. 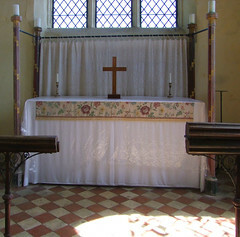 Horatia married Philip Ward, who at the time had been the curate in her father's parish at Burnham Thorpe. Winifred Gerin, in her biography Horatia (1970), describes the marriage as the one certain good that befell Horatia. On the other side of the chancel is a very good effigy of a 14th Century priest, sleeping under a canopy. Unfortunately, I was so taken by how lovely the church was that I didn't notice that my shot of it was out of focus. Well, if that gives me the excuse to go back one day, it is no bad thing. 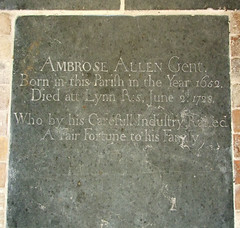 Meanwhile, a ledger stone to the west tells us that Ambrose Allen, who died in 1728, by his carefull industry raised a fair fortune to his family. How lucky he is to be resting now in this special place.